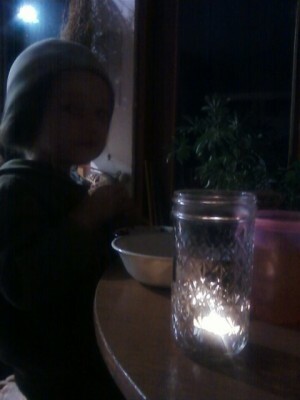 he lights up my life. i just recently learned of martinmas, and was intrigued because everyone seems to walk around carrying cool handmade candle lanterns. when i finally read some of the stories of martin of tours, and how he was a soldier who helped a beggar by offering him half of his cloak (in the version i read, anyway)… something clicked! i have felt unsure how to celebrate veteran’s day (the holiday we typically celebrate on 11/11 in the united states). i do not celebrate war. i do honor those who serve our country in this way, but i have a hard time knowing how to reconcile honoring war heroes while simultaneously valuing peace. my father, grandfathers, uncles, great uncles all served in the military, and don’t get me wrong, i appreciate their courage. i just want us to do things a different (peaceful) way. like sharing our cloak with someone less fortunate on a frosty cold night. like bringing light into the darkness, instead of violence. indeed, these members of my family have done many things in their lives (aside from their military service) that brought about peace, and so those are the things about them i wish to honor. just more my thing, i guess. so i like this whole martinmas tradition, and next year i’m hoping to do more than just haphazardly recite from memory (having read it earlier that day online) the story of martin, and make a haphazard tea light in a jar “lantern” that we didn’t even carry outside, much less go for a walk with. in this way we can honor courage and service without taking the focus off peace. on friday i got off work an hour early and had a chance to go outside while it was still daylight! when i offered the beach or the mike miller nature trail as options, quinn chose “no” and made his own suggestion: the bayfront. he is in love with that place!!! 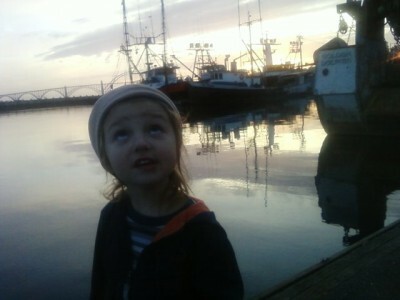 this boy is so interested in fishing and boats and lines (that’s rope to you lubbers). he just revels in it. see him reveling? he is carrying a trusty piece of line along for the walk, which he practiced tying up to cleats and tossing out into the water. he coils like a professional sailor, and has been tying some seriously impressive knots. his christmas stocking is going to be full of pulleys and clamps and caribbeaners and various lengths of line to add to his fun. i can tell he is talking to me in this picture, likely making up one of his signature long stories, involving- you guessed it- boats and fishing! i know he is going to pick up so many of the “basics” of preschool and grade school education, just through this one interest of his. i can see him wanting to get these stories on paper and how it is going to motivate him to want to write, for example… still a ways off, but i see it! i just love the way it makes his eyes sparkle and shine, just being on the docks. 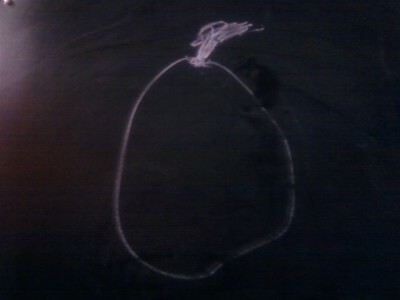 speaking of becoming literate, while he was drawing this apple on his chalkboard yesterday, he was telling me, “the O letter starts with no, and the S letter starts with yes!” it made a certain mama who has been wondering if she should be more pushy about reading and phonics, rest a little easier in her hands off approach. he had a few months of not wanting to read much (unusual for him! but we went with it- i know he is an ebb and flow kind of guy and i never want to push it on him and ruin his love for stories). now this autumn he is ravenously plowing through chapter book after chapter book (i’ll post sometime soon about some of the favorites!). now he is asking pointed questions about which letters make which sounds (and expressing it in oh such cute backwards ways… have to love that while it briefly lasts!) i also caught him pointing last night at the G in curious george and saying to no one in particular, “g starts with george.” he’ll have that all sorted out in no time, i can tell. drawing and crafting haven’t been his passion lately, but i am starting to see him want to pursue drawing again now, too. he went through a period of becoming easily frustrated with the drawings not turning out how he wanted, but he seems to be a bit more able to roll with it now. i think the “time off” from that has probably been a good thing. yesterday we swung by the aquarium, and visited some of our friends. we got to see the otters being fed. the aquarium always seems to give me a peek at the length of quinn’s attention span. about 3 minutes into the feeding, all of the other kids had badgered their parents to go onto the next thing. quinn seemed really content to stay for the duration of the feeding, commenting all the while on what he was seeing, and what was happening between the trainers and the otters. then after the feeding was finished, he and i stayed and re-enacted the things we had been talking about, taking turns being otter (stationing its nose on the trainer’s plastic ball-on-stick and then gobbling the yummy fish) and trainer (tweeting the whistle, holding the stick-ball-thing, and tossing the fish to the otter). 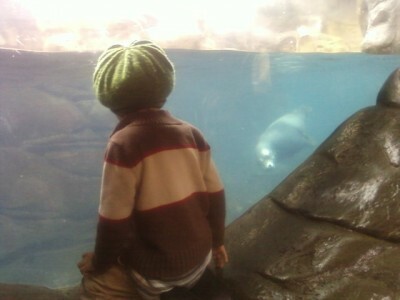 here he is taking another long look into the sea lion tank, his friend max visible in the tank, swimming a lap. sometimes i get caught up wondering what else i “should” be doing and whether i’m dropping the ball in some way with quinn’s educational experience. for me, it is a constant exercise in mindfulness to unschool. that includes keeping my own principles in view (e.g. his “education” is just a matter of life unfolding- i don’t need to contrive it!) and every now and then glancing at a handful of weekend photos and noticing how vast amounts of learning are being accomplished when we’re not trying. isn't it amazing what they learn without any pressure? i can't believe what my girl comes up with. i've made no attempt at teaching her letters, for example, (she's only 2.5yrs) and i keep discovering that she knows one here and there. if they're exposed to stuff their brains will sponge it up and they'll chose what to particularly take in. oh how i would love an aquarium to visit. thanks for the comments! monica, i couldn't agree more. i know i could have drilled letters and numbers with quinn and have him knowing them all by now, but then i wonder if he'd have had the space to pursue what has been most salient to him- knots and boats and fishing… lol. and yet, i think he can't help but pick up on the abcs when they're just all around him. we love our aquarium, though i have mixed feelings about animals in captivity in general, the oregon coast aquarium seems very well run, and the majority of the animals (to my knowledge) are rehabilitated animals that have been deemed unable to be released back into the wild (i also have mixed feelings about this, but it makes me feel marginally better….) but i can't deny that a lot of learning goes on there, at least for our family! i LOVE that he enjoys the aquarium and watching training sessions!! !